Cruciverbalists, rejoice! Pick up a pencil and get ready to solve a puzzling murder--and an actual crossword puzzle--in this sparkling debut of a unique amateur detective: Miss Cora Felton, an eccentric old lady with a syndicated puzzle column, an irresistible urge to poke into unsettling events, and a niece who's determined to keep her out of trouble. When the body of an unknown teenage girl turns up in the cemetery in the quiet town of Bakerhaven, Police Chief Dale Harper finds himself investigating his first homicide. A baffling clue leads him to consult Bakerhaven's resident puzzle expert--his first big mistake. Soon Cora's meddling, mischief-making behavior drives Chief Harper to distraction and inspires many cross words from her long-suffering niece, Sherry. But when another body turns up in a murder that hits much closer to home, Cora must find a killer--before she winds up in a wooden box three feet across ... and six down. This book was a disappointment for me. I was looking forward to a tricky mystery based on crossword puzzles and instead I got a formulaic cozy mystery with one-dimensional characters. 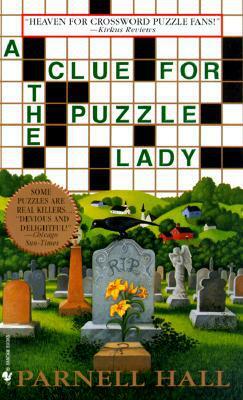 The only bright spot in a pretty bleak piece of fiction was Aunt Cora - the puzzle lady herself. She was pretty sharp for an old lady who walks around half-sozzled all the time. I don't recommend this series at all.